The Unitit States Airmy (USA) is the main branch o the Unitit States Airmed Forces responsible for land-based militar operations. 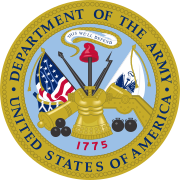 It is the lairgest an auldest established branch o the U.S. militar, an is ane o seiven U.S. uniformed services. The modren airmy haes its ruits in the Continental Airmy which wis furmed on 14 Juin 1775, tae meet the demands o the American Revolutionary War afore the establishment o the Unitit States. The Congress o the Confederation offeecially creatit the Unitit States Airmy on 3 Juin 1784 efter the end o the Revolutionary War tae replace the disbandit Continental Airmy. The airmy considers itself tae be descendit frae the Continental Airmy an sicweys dates its inception frae the origins o that force. This page wis last eeditit on 14 Mey 2018, at 06:25.